Utah football • Senior returns kickoff for TD for third time in two weeks. Trent Nelson | The Salt Lake Tribune Utah wide receiver Reggie Dunn (14) sets an NCAA record with his fourth career 100-yard touchdown return as Utah hosts Washington State, college football at Rice-Eccles Stadium Saturday November 3, 2012 in Salt Lake City. Washington State, down 31 points, desperately needed a defensive stop to start the second half. That plan lasted about 13 seconds, the exact time it took Reggie Dunn to burst through a pack of Cougar tacklers and race 100 yards for a touchdown. If there was a sense of déjà vu about the moment, it was because Dunn had turned the trick twice against California a week earlier. It was the fourth time in his career the senior had returned a kickoff 100 yards for a touchdown, which is believed to be an NCAA record. 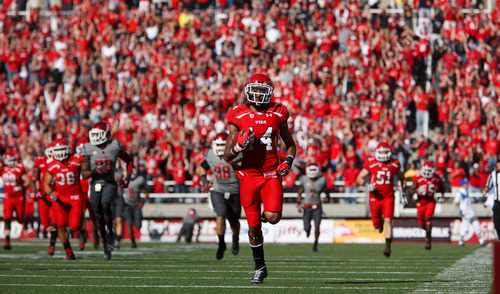 The feat definitely set a Utah mark, with his three returns for touchdowns in one season. "I put my hand on Charles Henderson&apos;s back and let him lead me," Dunn said. "It was all good from there." Aided by Washington State&apos;s poor containment  the Cougars had sucked up inside the Ute 40  Dunn didn&apos;t have anyone to beat and actually slowed as he neared the goal line. "I knew it was going to happen because before I went out there, I saw it in the kickoff return team&apos;s eyes," Dunn said. "They were ready to make it happen again." Dunn thanked everyone involved, including special teams coach Jay Hill, for creating the blocking schemes and the blockers who carried out their assignments. On Saturday as well as last week, Dunn showed patience in allowing his blockers do their job. During two of the three returns, he actually made contact with the wall before making his break. "It is impressive what he&apos;s doing special teams-wise," Utah coach Kyle Whittingham said. Dunn wasted little time when asked if he could continue this impressive run. "I can do it every week if they keep kicking it to me," he said. • Reggie Dunn sets a Utah school record with his fourth return of a kickoff for a touchdown. • Dunn has returned a kickoff 100 yards for a touchdown for the second straight game, with two a week ago.